Rev. 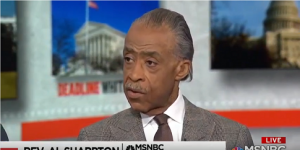 Al Sharpton argued emphatically Friday that the president's former lawyer Michael Cohen is not stupid during a segment on MSNBC's "Deadline: White House." Sharpton made his remarks in a discussion of a BuzzFeed report that President Donald Trump directed Cohen to lie to Congress about negotiations to build a Trump Tower in Moscow. "So, Rev., I don't know Michael Cohen. You know Michael Cohen better than I do," host Nicolle Wallace said to Sharpton. "But it seems like this reporting is consistent with the life he now acknowledges he led—blind loyalty to Donald Trump, asked to do unsavory and in instances illegal things for Donald Trump, but now maybe the only true thing that they've said in attacking him is that he's trying to shorten his sentence. He shortens his sentence not by lying but by telling the truth." "Well I think that is the most telling thing to me, and that is that if you are Michael Cohen—and Michael Cohen may be a lot of things, stupid is not one of them—you don't lie about lying to Congress to shorten your time where if you are now found to be lying about that, you may lengthen your time," Sharpton said. "Clearly he knows if he makes a statement, they're going to look into it since he's been convicted of lying. So the worst alibi in the world is to accuse a man convicted of lying, of lying to get shorter time for lying. I mean it doesn't even make Donald Trump sense," Sharpton continued. Last month, Cohen was sentenced to three years in prison for financial crimes and lying to Congress. According to the Washington Post, Cohen's crimes "included tax violations, lying to a bank and, during the 2016 campaign, buying the silence of women who claimed that they once had affairs with the future president."